I have been wanting to play with copper wire for a long while and finally did just that last night, of all time when I was busiest. Maybe it was stress due to the unfinished work and presentation (this morning). Anyway, I managed to steal some time off "work" to hammer two copper wires and twisted them into this two almost identical pieces. Not sure what to do with them but it was fun to do all the hammering..:) Maybe I should wire wrap the loops with some small beads. I can "see" green will go very well with copper! Also stole a little bit of time to wire wrap (simple) this donut jade pendant with gold filled wire - a special request. 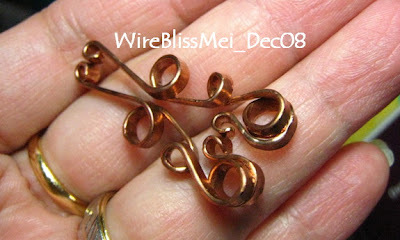 I really enjoy working with copper and many times combine with sterling. Hope all that hammering made you feel better. Nice design. like the hammered ones. Hope to get over the busy season soon! I love copper and work with it often. Luckily doesn't turn my skin green. What about making them into earrings?